The search for alien life doesn't end within the boundaries of our solar system. Scientists are now searching for moons orbiting alien planets that might play host to extraterrestrial life. A new project called the Hunt for Exomoons with Kepler (HEK) is the first systematic search for exomoons, or moons that circle planets outside our solar system.HEK astronomers, led by David Kipping at the Harvard-Smithsonian Center for Astrophysics, simulate billions of possible star-planet-moon arrangements using NASA's Pleiades Supercomputer. They then compare the results with actual data taken with NASA's Kepler telescope, which monitors the brightness of stars in an effort to find exoplanets that could harbor life. 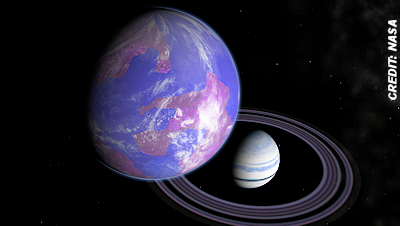 If one of the simulated combinations matches the Kepler data, that area warrants further exploration. . . .
First 'Exomoon' Discovered Around Alien Planet?